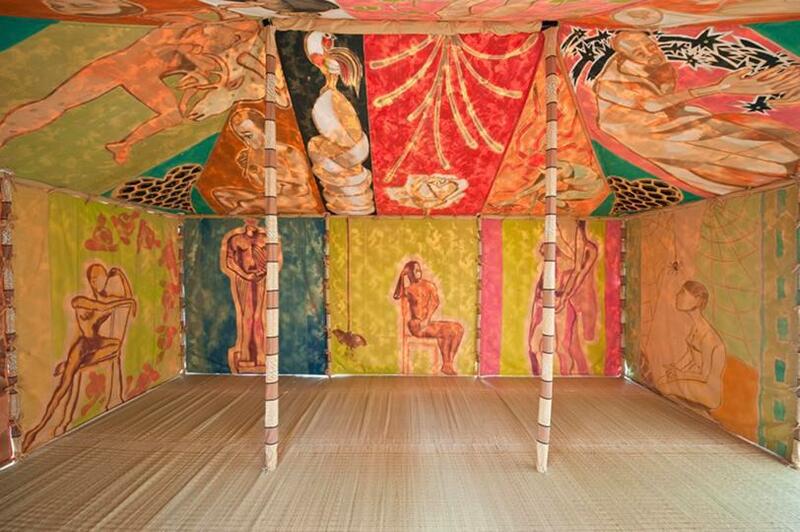 Francesco Clemente’s first solo show in Berlin in six years - Tents - comprises three large-scale canvas tents, with every aspect of the exteriors, interiors, walls and roofs painted in intricate detail. First used as dwellings over 3000 years ago, tent-like structures present an environment of shelter that can be traced back to antiquity. 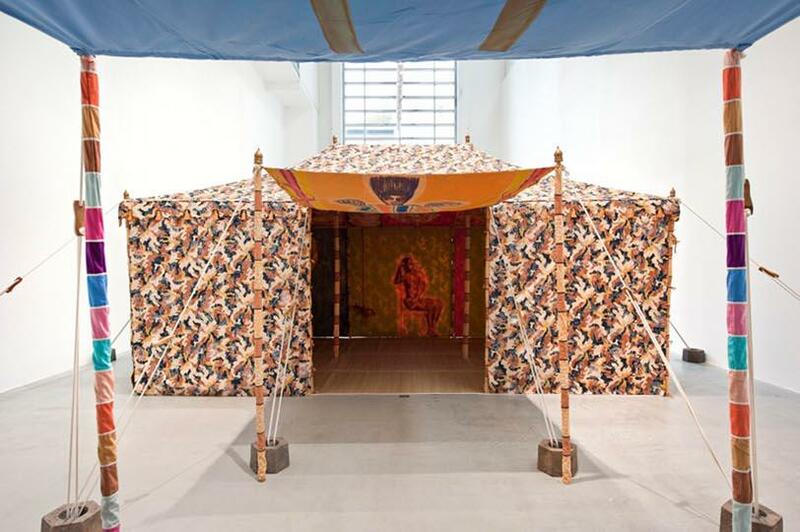 Clemente’s tents engage with this long history but are characterised by a discontinuity or fragmentation of context, bringing together myriad cultural and art historical references. Each of the structures immerses the viewer in a rich, colour-infused environment that melds Eastern and Western traditions of art, philosophy and religion, reflecting the artist’s nomadic desire not to belong. 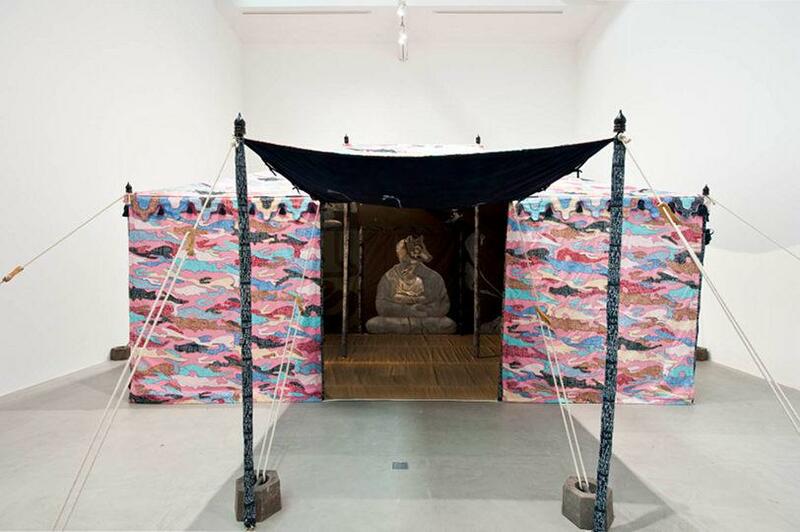 Produced in India, Clemente describes these tents as his ‘cave paintings’ which can be sheltered and slept under, or daydreamed and prayed within; these are movable chapels for contemplation of the sacred in a modern age defined by digital speed. 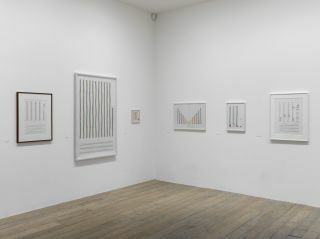 Expanding the traditional relationship between art object and viewer, these paintings function by enveloping and surrounding the viewer to evoke an experience of painting that is both seen and physically felt. 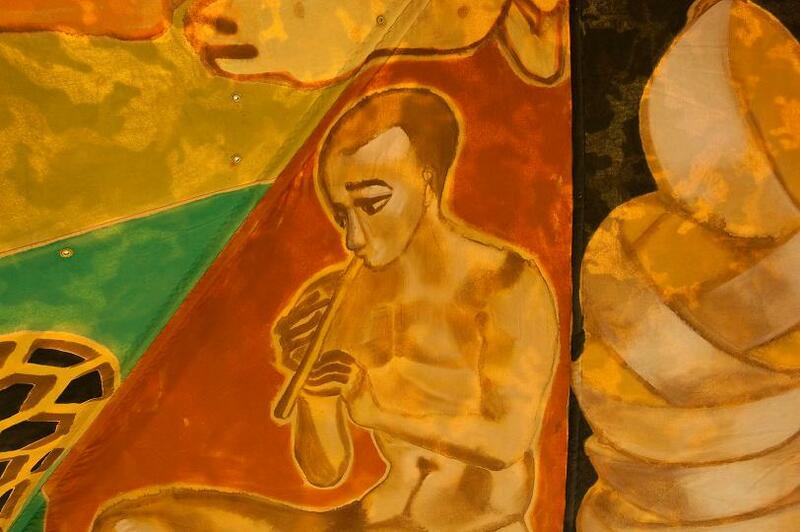 Standing With Truth (2013) is titled after a poem by the mystic Indian poet Kabir, who wrote ‘I eat with truth, I sleep with truth, I sit with truth, I stand with truth.’ Various disparate states of human action are depicted, in a realm of imagined endeavours that questions the nature or truth of our human condition. 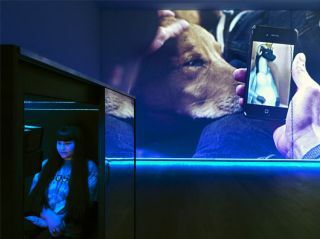 There is interplay among anthropomorphic and zoomorphic forms, a fluid exchange between the human and animal, suggesting a primal and intrinsic instinct. A winged beast with human features presides over the entrance; creatures including bees, dolphins and spiders accompany this, a primordial symbolism implied through these delicately formed animals and insects. 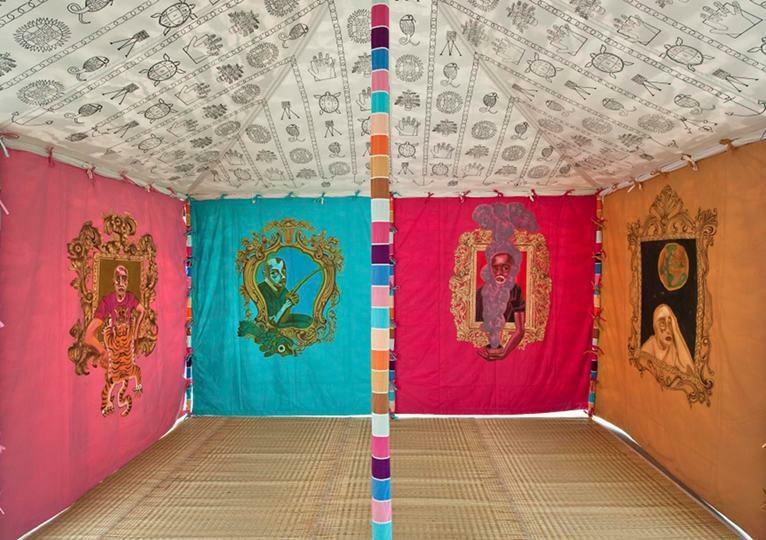 Museum Tent (2013) contains a series of emblematic self-portraits outlined by ornate rococo frames. 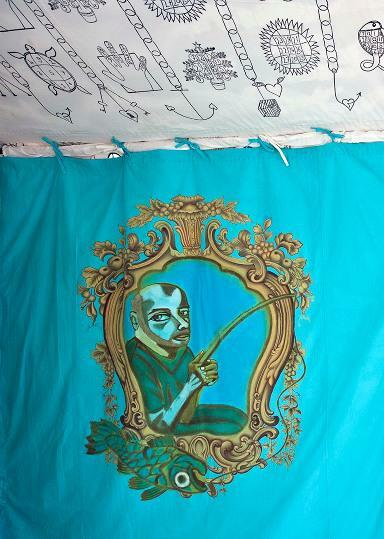 Each image escapes the frame, interrupting the illusory nature of these otherwise formal portraits; the artist’s arms drape a tiger skin over the edge; a fishing rod protrudes outwards, dangling a fish limply into the turquoise abyss of the tent’s surround. 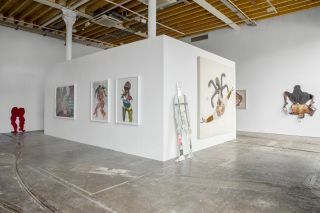 Clemente playfully explores personal identity and a subversion of convention. 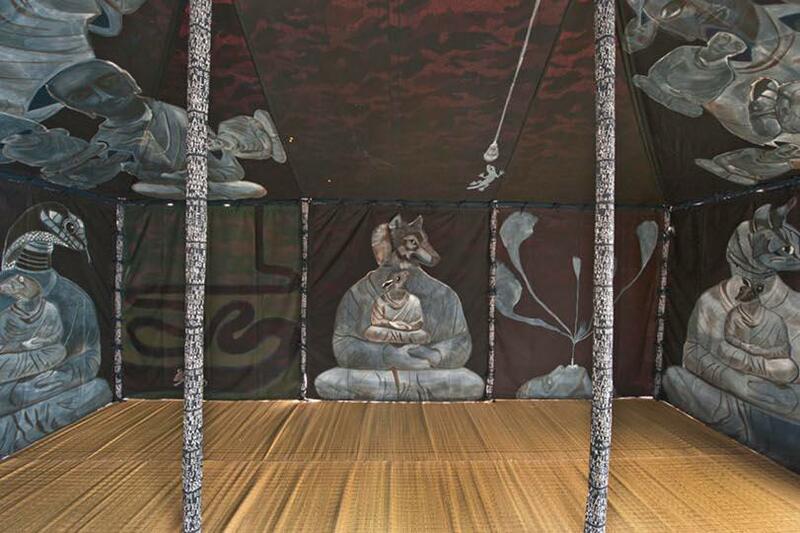 Amid a patterned grisaille of animal, botanical and numerical woodcut-block prints, the exterior of the tent features paintings of the facades of well-known museums, floating within ochre and umber ovals, depriving them of their geographical context. 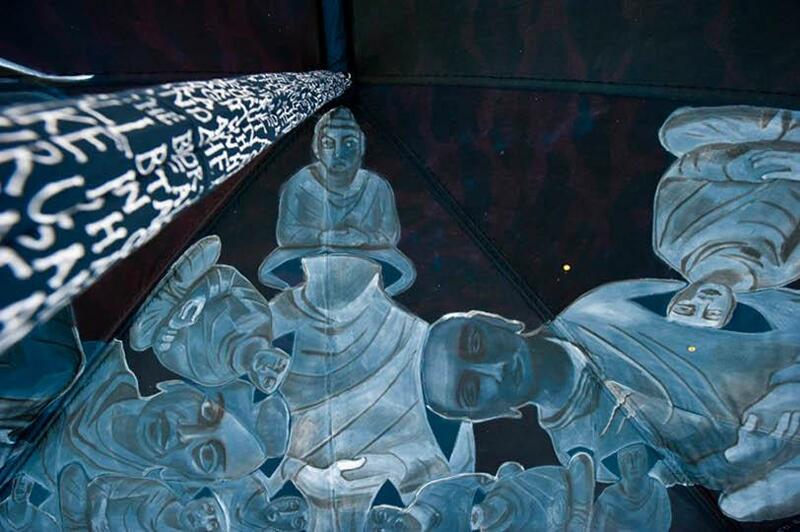 Taking Refuge (2013), presents a darker interior space, where a multitude of blue and grey painted Buddhas line the walls. Varying in scale, they appear to meld into one another as heads disappear into torsos, creating new forms that bloom out of a mass of conjoined bodies. The heads of animals such as cats and mice are depicted upon these Buddhas, raising questions about cycles of life and death, demise and return. 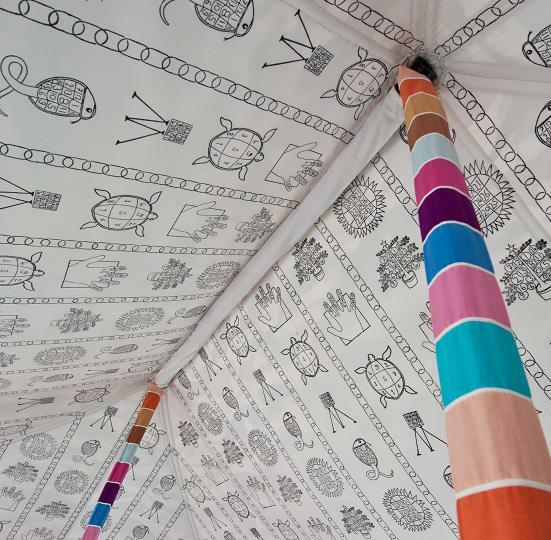 The exterior of the tent combines a colourful fragmented oblique with lines of gold embroidery, within which the Vajrayana vow of ‘taking refuge’ is printed in expansive blocks of text. 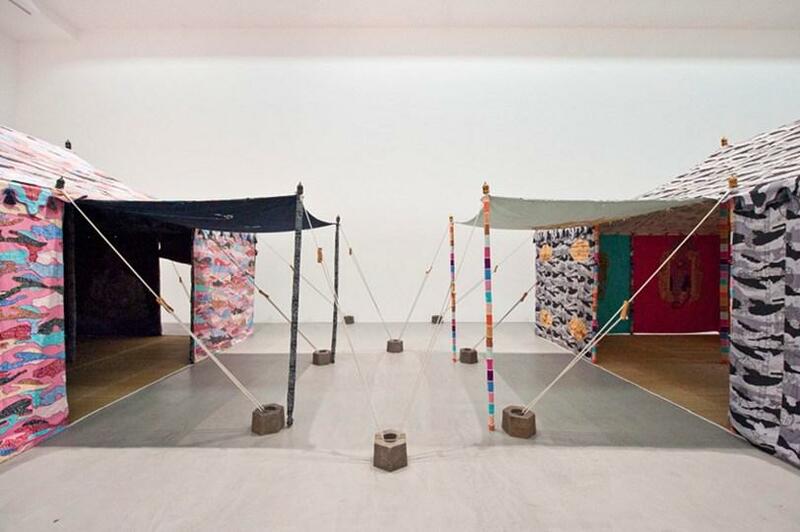 Tents demonstrates a unique staging of Clemente’s fragmented notion of the self, in striking visual form. The artist works with an eclectic visual language that unites Western tropes with his deep interest in Eastern spiritual, mystical and historical traditions. Taking influence from Italian frescoes and the philosophies of the Renaissance, the artist blends a broad Indo-European vision that once existed in antiquity with contemporary settings and themes - and in doing so, presents us with their inevitable disjunctions.